The Bichon Poodle is what you would call the ultimate teddy bear dog. It’s fluffy, cuddly, and has an all-white coat that looks like vanilla icing. Or like a polar bear if you want to get specific. For such a small dog, this mixed breed goes by a large number of names that intertwine its parent breeds. Check out this long list! 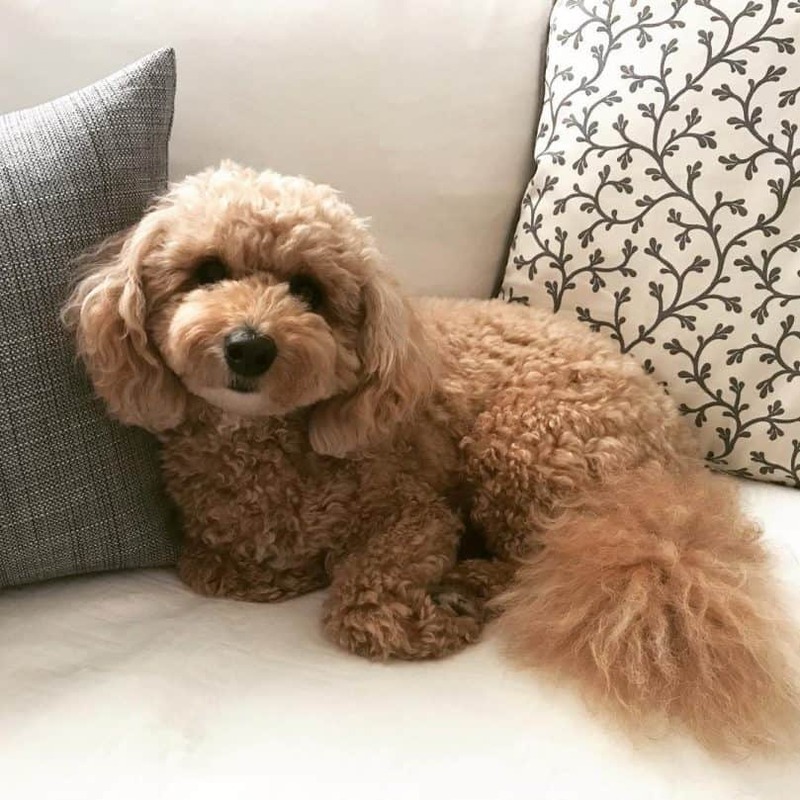 I put this article together to share the key characteristics and traits of the Bichon Poodle with anyone who’s interested in buying one. Or even someone who loves reading about dogs, like me. Let’s get started! Are Hybrids Really Healthier Than Purebreds? 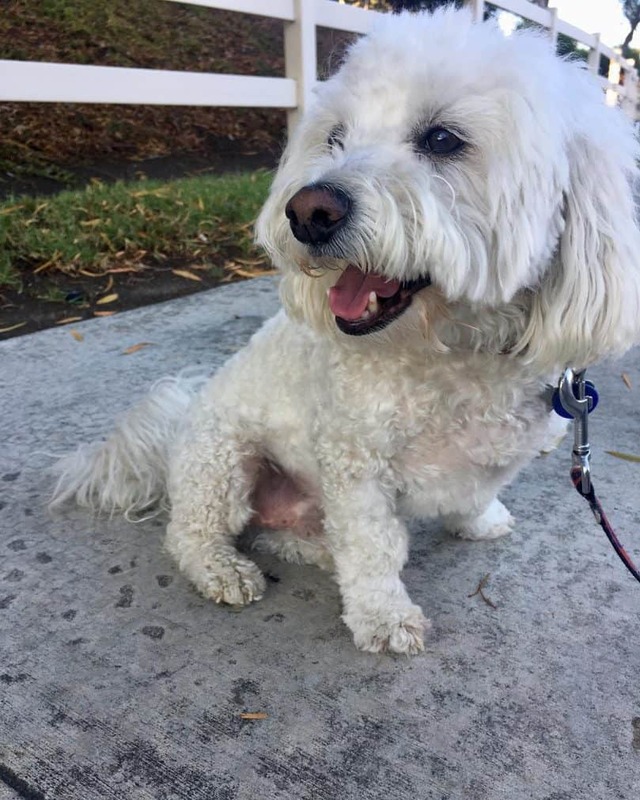 Can A Bichon Poodle Mix Learn Tricks? Are You Ready To Take Home A Bichon Poodle? The Poochon is one of the many designer dogs intentionally bred by humans to eliminate specific weaknesses associated with its parents. In this case, it’s the Bichon Frise and the Poodle. If we want to learn anything about their offspring, we must review certain genetic facts and statistics beforehand. Remember that poofy coat I was talking about earlier? This is the dog that carries it. 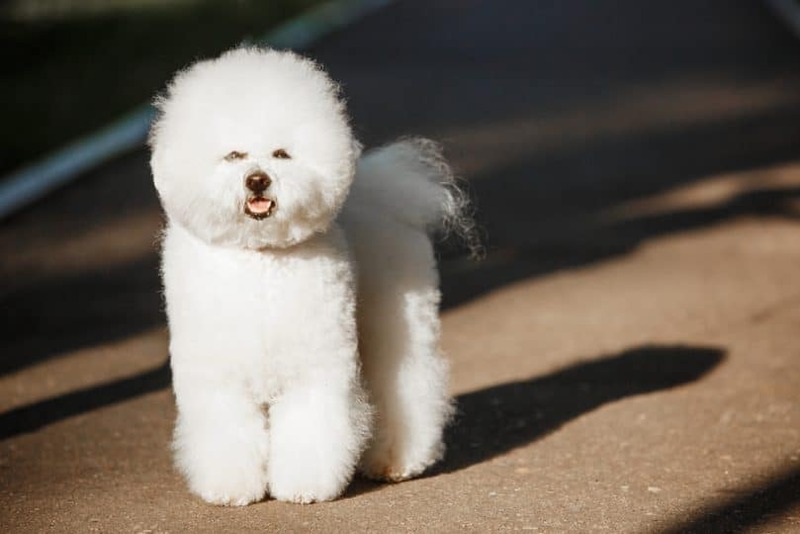 The Bichon Frise looks like a vanilla cupcake or cream puff with a height of 9 – 12 inches (23 – 30 cm) and a weight of 6.6 – 11 lbs (3 – 5 kg). It has an affectionate, playful, and cheerful temperament, with a slice of feistiness and sensitivity on the side. The primary health concerns to look out for are epilepsy, White Shaker Syndrome (which causes the dog to shake uncontrollably), and dyskinesia — a type of movement disorder. To the untrained eye, these issues may look the same as they all have to do with the dog’s bodily actions. But the vet will be able to make a proper diagnosis. A healthy Bichon Frise has a life expectancy of 12 – 15 years. Poodles of all sizes (toy, mini, and standard) have two universal crowd-pleasing traits. They’re one of the smartest dog breeds and their coat is “hypoallergenic.” It’s no wonder their genetics are so popular amongst designer pups. The height and weight of a Poodle can be broken down into three categories. Across the mini, toy, and standard growth charts, the height fluctuates between 9 – 24 inches (21 – 61 cm). The weight between 6 – 60 pounds (3 – 27 kg). But don’t worry, a Poodle’s personality and lifespan is much more consistent across the board. All sizes are intelligent, active, and faithful, and live between 12 -15 years. Like the Bichon Frise, the Poodle may suffer from epilepsy at some point in its life. It may also experience the following health issues. OK, so now that we’re familiar with the parental principals, let’s see what happens when you cross genetics and make puppies. 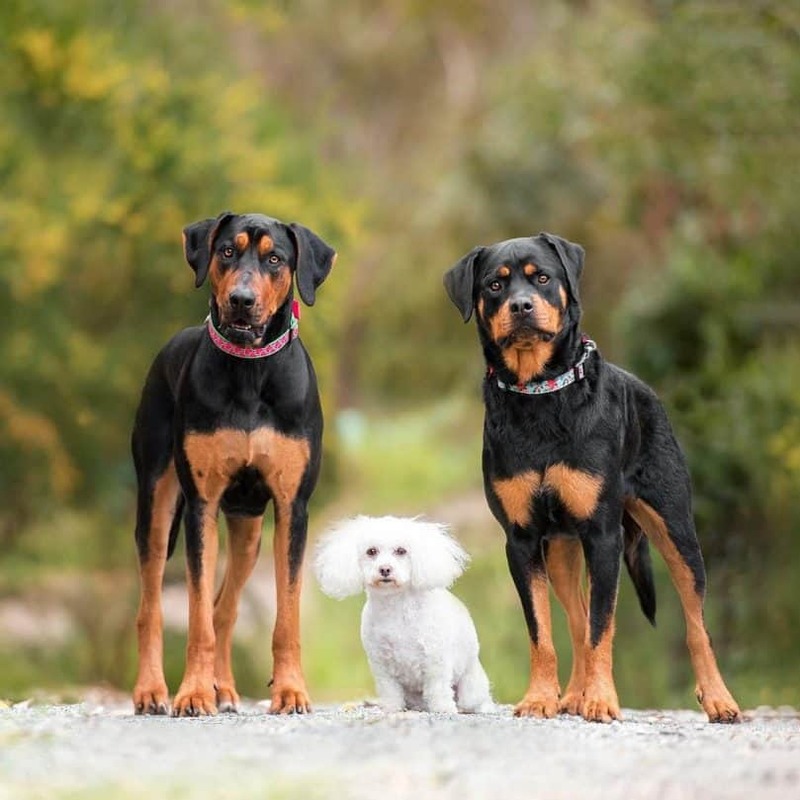 The Poodle and the Bichon Frise have identical lifespans, so their offspring are predicted to live between 12 – 15 years as well. A full-grown Bichon Poodle should be about 12 inches (30 cm) tall at the withers with a weight of 8 – 16 pounds (4 – 8 kg). They’re born with almond-shaped eyes, long ears hanging around its head, and a short snout. It’s most distinctive feature, however, is that white wooly coat that comes from the purebred Bichon. The Bichpoo can also be found in cream, black, blue, and apricot. There are certain arguments in life that will never be settled. Blonde vs. brunette, sweet vs. savory, and hybrid vs. purebred. When it comes to dogs, there is no definitive, black and white answer. There will always be at least one exception. Although, the point of cross-breeding is to eliminate certain health concerns. 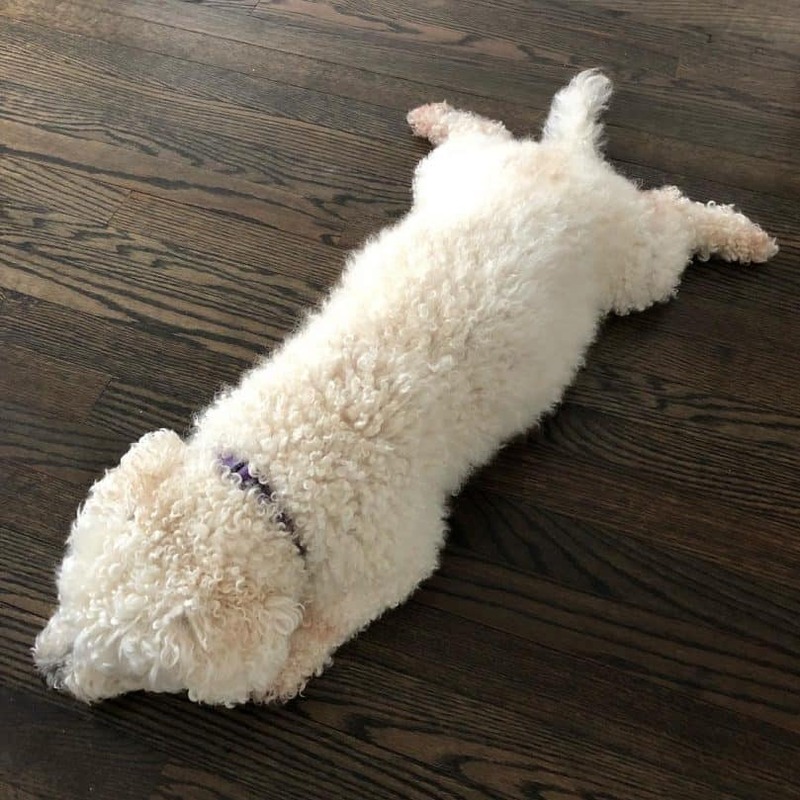 In the Bichon Poo’s case, cross-breeding was meant to erase the Poodle’s vulnerability to Addison’s disease and gastric dilation (the scientific term for bloat). It’s not a major health concern, but both the Poodle and Bichon Frise are also susceptible to gum and teeth-related infections. So, what predictions can we make about hybrid dogs? 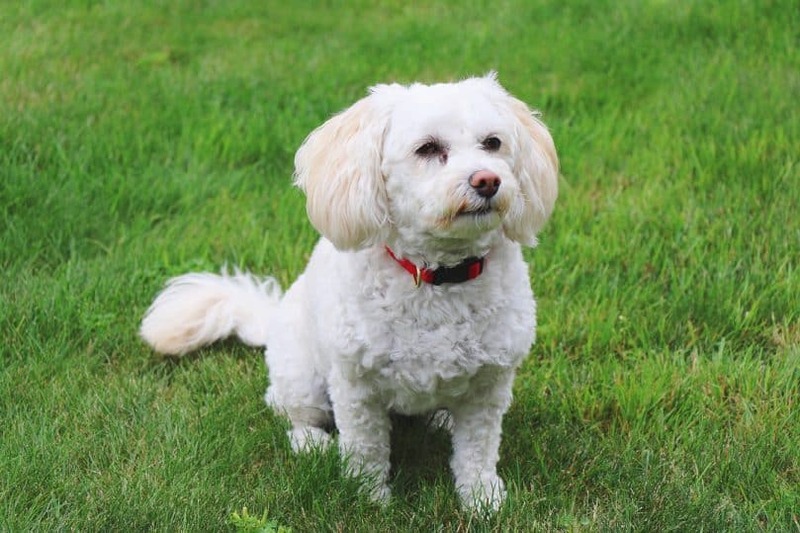 The first generation of the Bichon Poodle Mix is healthier than its parent breeds. The second generation is not as healthy as the first, and any issues that arise in round two will most likely carry on in round three and so forth. Because of the Poodle’s high intelligence, the Bichon Poodle will likely be easy to train (and that includes housetraining). With alert and active parents, the Poochon will be no different. This mix needs daily exercise (preferably outside) for at least 30 minutes. It has a lot of energy to burn. Keep in mind that mental and physical stimulation are different, and the Bichon Poodle Mix needs both. When it’s not running around, it needs a chew toy to stay entertained. A bored Bichpoo will bark and whine (or turn your shoes into a chew toy of its own with your permission). OK, we get it. The Bichpoo is smart, but can it be taught to play dead? Or roll over? Or give a high-5? Yes. Yes. And Yes. This breed is capable of learning a solid amount of tricks. Just make sure to have plenty of treats on-hand for positive reinforcement. Watch how well this Bichpoo gives its owner a high-5 and pay attention to how she rewards her dog! It’s something you can try at home, too. Let’s be real for a second, no dog is perfect. Every breed comes with at least one trait we wish we could alter. For the Poochon, it’s their high-strung personality and nervousness in unfamiliar situations. This comes from the Poodle side. If your Bichon Poodle Mix is not socialized at an early age, it can develop separation anxiety when left alone for hours. It’s also essential for this breed to meet other dogs to tone down its nipping. The Bichpoo can show moments of mild aggression around unfamiliar dogs. But enough about the bad, it’s time for the good. The Bichon Poodle is a loving companion for adults, children, and strangers, which makes it one of the best family dogs. Both the Poodle and Bichon Frise are recognized for their unique (and sometimes silly) haircuts. It’s more common in show dogs to have poofy heads and paws, but you’ll be able to groom your Bichon Poodle any way you want. Haircuts every two months are a necessity to keep its coat tame. If that sounds like too much responsibility or money, you can shave your Bichpoo in the summertime. Its coat causes minimal shedding, which makes it a good option for owners with allergies or who want a clean house. The last part of grooming requires occasional teeth brushing to keep mouth infections at bay. If we can have specific diets (like Whole30, Keto, and Atkins), then so can dogs. Bichon Poodle owner Sandy Rothra recommends feeding your mix canned dog food because it contains a higher percentage of meat protein. But, if you’re in the mood for a little DIY project, consider making your pooch’s food at home. All you need is some cooked chicken, brown rice, and green/yellow/orange vegetables. This counts for all dog breeds: if your pup gets sick with a kidney or heart issue, you will need to change its diet. You should never feed any dog chocolate, onions, grapes, and raisins. It’s poisonous to them. 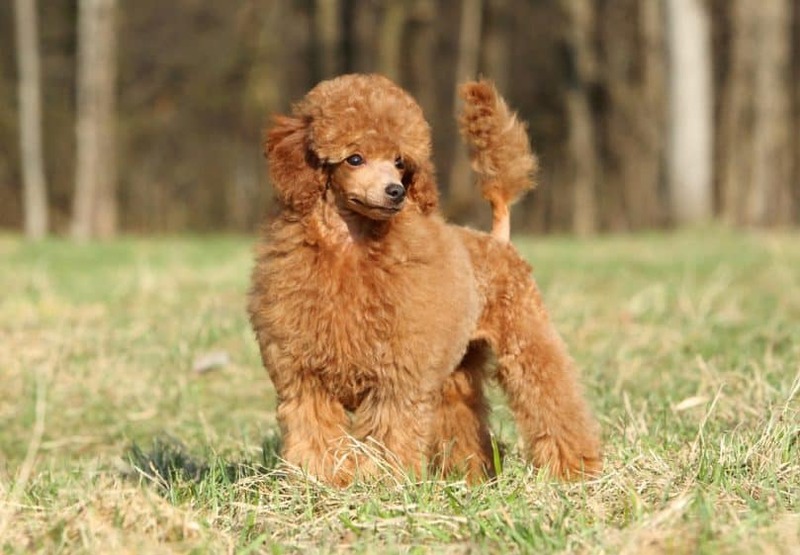 The Poodle has been used a lot in the genetic crossover, which means you have a lot of options to choose from! If you Bichpoo doesn’t sound like your cup of tea, how about these other teddy bear dogs instead? The average cost of a Poochon is $1000 with the range beginning as low as $400. The thousand dollar mark is standard for most designer dogs. Depending on your moral compass and price preferences, you’ll pick where your Bichon Frise Poodle Mix comes from. Popular adoption and rescue websites are the “Pets” section on Overstock and Poo Mix Rescue. For Canadians, Kijiji is an excellent resource as it offers a mix of high-priced breeder puppies on sale, and “Wanted” section where shoppers can describe the exact dog they’re looking for. The top three breeders websites are Spruce Ridge Kennels in Ontario, and Rolling Meadow Puppies, and Koedam Kennels in Iowa. Luckily for you, the Bichon Poodle is relatively easy to train, regardless of what kind of mother or father you want to be. 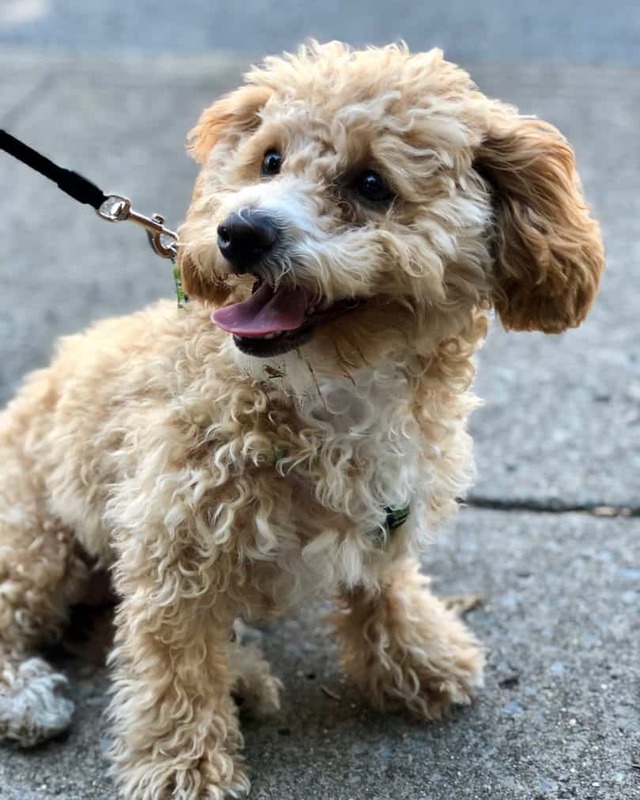 The Poochon will live its happiest life with someone who likes to exercise, go to dog parks, and will provide it with lots of toys. The wrong owner for this mix is someone who doesn’t have enough time to socialize it thoroughly, which, in turn, will lead to an anxious and lonely dog. Do you have what it takes to bring home a Bichon Poodle? Comment below and let us know!